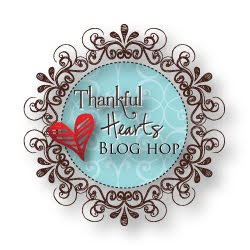 Well, it’s new release time at Verve and we’re topping off our Thankful Hearts Blog Party with a blog hop featuring three new sets that just released, all focused on thankfulness. If you’ve been hopping and arrived from Jackies’ blog, then you’re right where you should be. If you’ve just happened by, then you’ll want to hop on over to Poetic Artistry to start from the beginning! And to make this hop even sweeter, we’ve got a special treat hidden along the way for one lucky commenter. So if you see something that makes you smile, be sure to give a little shout-out in the comments for a chance to win our entire release! Anyway, for my card here, I thought it would be only fitting the day after Thanksgiving, to use a few little "leftovers" from previous projects! The tree was an extra from my Verve Project Parade Christmas box. The little black frame was also from that project after I cut it with my Slice machine only to figure out it was smaller than I had wanted it to be. I used the little sentiment from the set coming out tonight, Thankful Hearts and matched it up with my new Fleur de Lis Cuttlebug folder and some more scraps from my desk and then finished it up with some cream organdy and heated it up (just like leftovers!) to give it a little crinkle! Thanks for hopping by! Next up on the hop is… LYNDA! Have fun! SUSIE Q-TIP: I think I've said this one before, but it never hurts to hear it again. Re-purpose your leftovers. If you've cut something from your die cutting machine, stamped something that didn't fit with your original plan, or punched something that wasn't the right color, just push it to the side in a little pile within eyesight, and try to reuse them for another project soonafter. Oh I do love this card, so many contrast and colors that fit together perfectly. This is such a fun card. I love those colors together. Cute! I am so glad you used that sentiment! I love it! Great use of the empty frame on this card! How clever - to use "leftovers" to make a stunning card! Eeeek..FABulousness, L O V E it! Fabulous, Susan! I'll take leftovers like this any day!! Love the black frame - ties everything together but doesn't cover up too much of the pretty papers! this is precious, I adore the polka dotted tree....so cute.....I luv it! Fun color combo! Isn't it great when scraps all come together perfectly to make an amazing card?! Very pretty card! I love how you used "leftovers" as a tribute to Thanksgiving. Too cute!! This is great! I like how you included different elements! Also, I agree with you...I always save scraps and things. One because you never know when something that you felt was a mistake might come in handy, and two because I don't like to waste paper!! Nice job! Cute card - love that tree! Oh, I love the whimsy of this card. Very lovely. Well, this is so cute I can hardly stand it! I keep my little doodads waiting for repurposing in a silver compote (junk store find) on my desk! Oh, how clever you are to use the fleur-de-lis embossing with the Merci Beaucoup sentiment! French all the way ...... so cute! Wow! I love this! I love that you used leftovers. Absolutely perfect for today!! Susan, this is amazing! Love what you have done with 'leftovers". I am so glad you choose that stamp. Nice Job. Love that you used left overs. You know what I love about this blog hop. Everyone style is so diverse. Great cards and all from scraps! Great Card!!! Excited for the new stamps!! Wish my leftovers would look so good! Terrific! left overs are the best and you put them together so nicely! What a neat card!! Very nice! I love re-purposing. Thank you for the reminder and great card. God bless! Susie, I love this card! I love the colors and the background texture is so pretty! I really like how you used this release, paired with last months. So Beautiful! A beautiful and stunning card! Adorable card! and thank you for the inspiration! Oh Susan, this is so whimsical and fun!! I LOVE your frame, tree, and polka-dotted band!! What a charming card!! susie...this is super cuteness! love the colors, the textures, and the playful layout! what a fun and cheerful card! Adorable card Susan! Love all the texture! Love it, Susan! I was crackin' up over the "leftovers"!! Girl, this is so modern and fresh!! I LOVE it! I can never get my cards to look all cute like that...I'm so jealous! Love the color combo too! Oh wow.. I love your "leftovers"! WHat great colors and love the texture!!! Great card! I really like the whimsical 'flavor' of this card! This stamp set is soooo versatile! This is a fabulous card! I love the multi-dimensional fell that is has. All the textures and layers are just wonderful! Beautifully done! Thanks for the tip! Adorable card - love it!!! Your tip is so right on...I do that all the time! Hope you have a great weekend! what a creative idea using the thanks set Susie! gorgeous card!!! Wow, very cool layout & great colors - love it bunches! I luv leftovers!!! Cute card. Leftovers never looked so good. Like the color combo. Your little q-tip is right on ...I have found more cool uses for oopses..and I like what you pulled to gether from your pile. Love your scraps! Wonderful card! Love how you were able to re-purpose some of your leftovers! Cute card...great usage of left overs. I can never get enough fleur de lis! Good point on recycling your scraps. Very pretty and modern! I like your colour combo! Beautiful Susan! I love the fun mix of elements, you did a great job! BIG HUGS! I really enjoy seeing the layering of this card. It is very nice to see cards like this to learn and have idea's. I appreciate your sharing and your talent. What a cool card. I too save a lot of scraps and feel good to bring several of them together in a project. Thanks for the tips on using leftovers. gotta do a tree like this. Great inspiration. Great card, with that warm color combo. Ooh La La! What a great bit of re-cycling! I have a pile about 6 feet high of 'accidents', so I'm constantly re-purposing. Too cute Susan! I LOVE the colors and all the fun details, great job! I love your card - the texture and the layout and the colours and the embellies, etc.etc.etc. Thanks for the tips on using leftovers, too. Great job! What a gorgeous card from leftovers!! Great card! You're right, I use a lot of "repurposed" pieces for my cards and who would know? Thanks for sharing your talents, I've always enjoyed your tips. Leftovers never looked so good! I'm going to look through my stash pile of "oops" items and see what I can repurpose. Love your card. Love the design, the layers, and textures, Susan! Wonderfully done!!! What a nice card. thanks for sharing it. Fab ..i do this all the time..i have baggies with different colours in them. Love your creative ways of using "leftovers". Great card. This is very creative! I love how you used the double frame as an accent piece. Scrap cards are some of the joys of card making, so I have to force myself to pitch some really TINY pieces...LOL TFS! Love the use of these colors together! Just gorgeous! I love this card! All the elements are perfect and your sentiment is my favorite- I love anything in French! Gimme those 'leftovers' any day. Such a gorgeous card and I love all the detail. Beautiful job. Susan, this is just gorgeous! love this card, it is beautiful :)! Love the colors you used on this card. The texture and layers are awesome! So fabulous! Way to use your 'leftovers'! Pretty card. Very cute! Love the unique design! Fab "leftover" project - what a great theme and a great result! I love your card! The texture in the background gives your card that extra little "somethin'"! Great card and thanks for the reminder about using items that didn't work on other cards. Neat frame and dry embossing. Great card..traditional colors and yet not a traditional card..fantastic job! I've been wanting a slice. Love the idea of repurposing things that aren't quite right on another project. Fantastic card. Love your crinkly bow, I'll have to try that! Great use for leftovers! I love the color combo and layout. Nice card. I love the background. Love your timing with the leftover theme - lol! Your card is adorable...especially love the frame addition! love the picture frame your created--you have inspired me--will give it a try!! Love your card--great showcase of the new VERVE stamps!! Very cute Susan. I love the 'window' frame. It creates a feel of a nice winter scene. VIVA la LEFTOVERS! You did a great job creating this card. Nice mix of texture and colors. Great use of leftovers! I like the layout of all your elements! Brings back all those years of congegating french verbs - very nice card, Susie!